Product prices and availability are accurate as of 2019-04-13 01:36:37 EDT and are subject to change. Any price and availability information displayed on http://www.amazon.com/ at the time of purchase will apply to the purchase of this product. ALERT: This specific Access Code is only valid for 5 months. Create a dynamic, self-paced, self-directed learning environment for students or even current business owners to master the essentials of QuickBooks Online Plus (QBO) while reviewing their understanding of financial accounting and reporting. Owen's new QUICKBOOKS ONLINE FOR ACCOUNTING focuses exclusively on QBO. With easy-to-read instructions, examples, demonstration videos, and manageable assignments, QUICKBOOKS ONLINE FOR ACCOUNTING requires little, if any, in-class-instruction. This self-paced tool is an ideal supplement to any accounting course. Readers logically progress through real-life case examples and assignments. 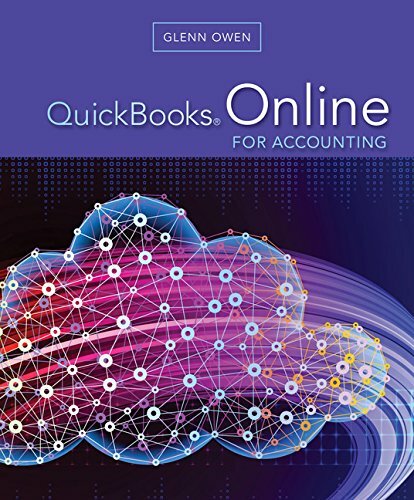 The first chapter discusses important differences between QuickBooks' desktop and online versions and how users can efficiently import files. The book also introduces how to solve accounting issues and generate useful financial accounting reports using this online computerized accounting software application that doesn't require a lab or software installation.